Why buy tires online, when you can buy tires local?!? Bavarian Rennsport now offers Tires and Wheels. We’ll even match the prices found on TireRack.com. Trust Bavarian Rennsport for total BMW, and MINI care, including Tire Changing and Tire Balancing Services. Whether you need new tires or need to repair a flat tire, you will love our affordable prices and quick turn-around times. To insure the best quality of driving and optimal performance we use the Hunter Engineering’s Tire Changer and ROAD FORCE® ELITE DIAGNOSTIC WHEEL BALANCER. The Road Force® Elite diagnostic wheel balancer delivers exceptional balancing service and performs a Road Force® and balance faster than a traditional wheel balance. The Road Force® Elite solves wheel vibration problems that traditional wheel balancers can’t fix. This diagnostic wheel balancer machine detects non-balance, radial-force related problems associated with tire uniformity, tire and rim runout, wheel to balancer mounting errors and improper bead seat of tire to rim. Hunter Engineering is the only equipment trusted by BMW, and Mini Cooper and most other luxury car manufactures. The graphic below highlights our current tire specials. If you have any questions or would like to book an appointment, you can contact us at (904) 270-9390. Advancements in automotive technology have made achieving an optimum ride more complex. The demand for more responsive equipment has led to tighter suspension and lower profile tires. These features make vehicles more sensitive to vibration forces. Standard balancing often proves effective in addressing ride vibration problems. However, there are certain non-balance related factors that standard balancing doesn’t address. Tire and wheel manufacturing is very precise, but some inconsistencies in weight, stiffness, and balance are inevitable. 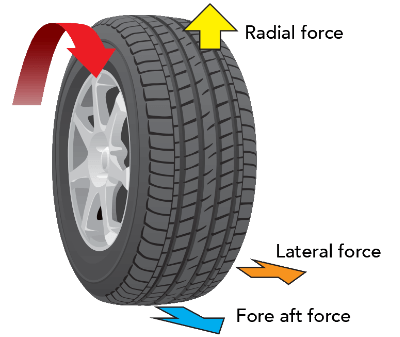 Called lateral or radial runout, these inconsistencies are low or high points in the tire and wheel construction. Some tires may have a spot that is stiffer than the rest of the tire. This condition is called force variation. Runout and force variation can cause noticeable ride vibrations. If standard balancing isn’t providing the smooth ride you want for your vehicle, it is possible that runout or force variation are the real culprits. Match mounting and road force balancing can be used to counteract these issues. At one time, the common solution to issues like lateral or radial runout and force variation was match balancing. Tire technicians would mount a tire and wheel assembly together and align a marked point on the tire with the valve stem on the wheel. This supposedly aligned the high spot in the tire with the low spot in the wheel. However, this process is largely ineffective. The valve stem is no longer guaranteed to be the low point of runout in the wheel. Wheels have become more complex and more ornate, making the valve stem placement cosmetic rather than strategic. Although force match balancing can still produce results, the most reliable process for eliminating these non-balance based vibrations is road force balancing. Road force balancing, sometimes called ride matching, is the most effective way to diagnose and resolve runout or force variation vibrations. A road force tire balancer, a state-of-the-art balancing machine, uses a load-roller to simulate the force of the road, and thereby ascertain the combined uniformity of a tire and wheel package. Hunter ROAD FORCE® ELITE DIAGNOSTIC WHEEL BALANCER measure the force variation and runout of the whole tire and wheel assembly. They also measure and distinguish between the radial and lateral runout of the wheel and tire individually, providing a more accurate account of the variant forces at work in the assembly. This information is then used to determine what steps to take to compensate for any tire and wheel inconsistencies. This may mean simply adding weights or even remounting the tire and wheel to minimize the overall runout. A variety of factors might cause ride vibrations. Standard balancing, match mounting, and road force balancing only address a few of the possible causes of ride discomfort. Road force balancing may only be recommended if standard balancing proves ineffective in diagnosing the issue. If both standard balancing and road force balancing do not address the issue, it is possible that the vibration source is not the tire and wheel assemblies. To book your tire and balance service, call (904) 270-9390. For other services, Bavarian RennSport offers the ability to book a FREE inspection, oil change, diagnostic, and pre-purchase inspection appointments online. To prevent no-shows, for all of the appointments, except the FREE inspection, you will be required to input your credit card to reserve your appointment. We require 24-hour cancellation notice for a full refund.